Google’s Hindi Phonetic Typing Tool installed on your computer. Thanks to this video, I found an old version of Google Input Tools here. To be safe, I copied it to my Google Drive. A link is here. Once you download and install it, you should be good at typing in phonetic Hindi once again. I found two more software. 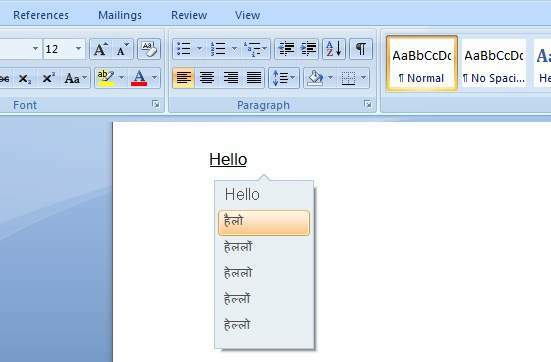 First one is Microsoft Indic Language Input Tool which works great and is an effective alternate to Google Hindi Input Tool. Installation exe could be downloaded here. Once installed there should be a new option available in your language bar. See below. When this tool is active it lets you type phonetically in your MS Word document or in any other place such as browser window. See below. Second one is Hindi Indic Input 2 is an another alternate to Google Hindi Input Tool. Install-able exe file could be downloaded here. This is a zip file so extract/unzip it into a new folder and run the exe file. Once installed there should be a new option available in your language bar. See below. Now open a Word document and type something. This tool gives a detailed list of words related to currently typed letter. See below. I think this is an useful addition to this Hindi Phonetic Typing Tool as it gives you an idea of the possible combination you may try to obtain a desired output from your key strokes. I really found it useful and give it a try when typing new articles in Hindi. If you are using Google chrome there is an extension you can use to type in Hindi online. Here is the link to extension page. I used it for some time. In fact it worked great for some time but then it stopped to show word prediction when you typed a word. Hindi Phonetic Typing Tool or in any other regional language tool I think. Since this feature stopped to show word suggestions, the typed words were mostly incorrect and hence I had no option but to look for an alternate to this extension. You can use Google Translate website for typing in Hindi language. It gives an option for voice typing as well. In fact Voice Typing in Hindi is a revolutionary feature which gives much faster and hands-free user experience to the writer to write quickly and efficiently. I will post a new article on voice typing in Hindi soon. You may find some of interesting articles I have posted in Hindi in my another website.